"I just wanted to take care of animals at first, because it's the most fulfilling thing to me." 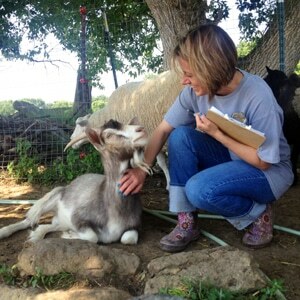 Alecia is the Shelter Director at Heartland Farm Sanctuary in Madison, Wisconsin. Heartland Farm Sanctuary opened in 2010, and is a nonprofit organization dedicated to helping homeless farm animals in Wisconsin, and they focus on building connections between animals and vulnerable youth in the community. Alecia has loved and lived with animals her whole life and is passionate about animal rights issues. Her favorite friends at the Heartland barn are the turkeys, chickens and roosters. Q: How is working with farm animals different than dogs or cats? Q: What advice do you have for someone wanting a career in animal rescue, specifically ? Q: What is your favorite animal to work with?